Experience the amazing beauty of Kualoa on this Zipline Adventure! This amazing Treetop Canopy Zipline Tour begins at the top of the beautiful Ka’a’awa Valley with 7 exciting tandem sections, 2 suspension bridges (you are clipped in across the bridges) and 3 mini-hiking nature trails about 5 minutes in length. If your surroundings look familiar, it’s probably because you’ve seen Ka’a’awa Valley in one of many movies...like Jurassic World...that have been filmed here over the years. Each zip line is named after a culturally significant aspect of the valley with zip lengths ranging from 200 feet up to a quarter of a mile in length! Guests will learn about Hawaiian traditions and experience Ka’a’awa Valley first-hand zipping through native flora and fauna and crossing natural streams. Each zipline provides a new cultural experience and learning opportunity for our guests. No Experience Required! 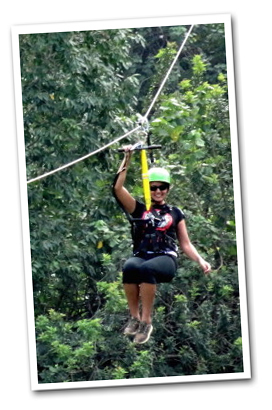 Its easy and fun … even for first time “zip liners”. No need for gloves to stop you... we use an automatic braking system so you don’t have to do a thing... we’ll stop you automatically at the end of each line. Restrictions: Minimum weight: 70 pounds, Maximum weight: 280 pounds. Must be between 4’8″ and 6’9″. Required Waist Size between 22 in (55 cm) and 50 in (127 cm). Required Upper Thigh Size between 18 in (45 cm) and 28 in (71 cm). Closed toe shoes must be worn. For questions about restrictions please contact us. Guest are required to sign liability waivers for all tours. Transportation: Transportation is available when you purchase one of our multi-tour packages. The buses leave from Waikiki at 6:30 am each morning and return in the afternoon. For the safety of our guests we require that all participants on the Zip Line Tour meet the following body size requirements. Height & waist restrictions ensure proper fit of the harness. Weight restrictions ensure proper zip speeds (in general, the heavier you are, the faster you go). All Zip Line Tour participants must be able to hike our mini-trails on uneven terrain and gravel pathways. Hikes should last no longer than 5-10 minutes and are generally in shaded areas. We ask that anyone who knows themselves to be pregnant refrain from participating in the Zip Line Tour as a precautionary measure as wearing a harness may cause complications for the mother and/or unborn child. Closed toe shoes must be worn on the Zip Line Tour and are also available on property for those who may need them. Long hair should be put up in a bun or pony-tail type hairdo to prevent entanglement with Zip line apparatus. Loose jewelry or clothing should be avoided or tucked away on the Zip Line Tour as it may become entangled with zip line apparatus. All Zip Line Tour participants will be required to wear a harness which has straps placed at the participant’s upper thigh, waist (above hip bones), and over each shoulder. Anyone who has an injury to these areas should refrain from participation to avoid aggravating the injury. Also, proper clothing should be worn to allow room for these straps without interference. Q: Are there Weight Restrictions? A: Yes. In order for our guides to properly work the braking system on the zip lines, guests must weigh between 70 and 280 pounds. A: Guests should be in moderately good shape and capable of hiking on varied and rugged terrain. Any guests with Heart Conditions, Spinal Issues, or Joint Pain should consult with a doctor before engaging in any strenuous activity. Women who are pregnant are strongly discouraged from participating in the zip line tour. Please consult with your doctor. 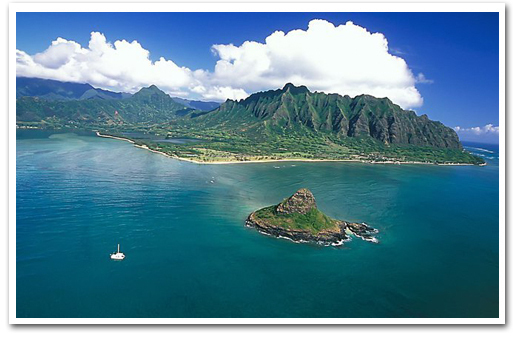 Kualoa reserves the right to refuse service to anyone on the basis of health risks. Q: Do tours get Canceled for Bad Weather? A: Tours will only be cancelled for severe weather such as lightning storms and high winds. 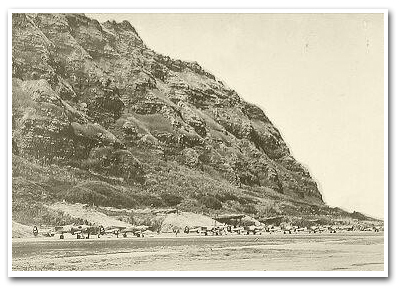 If your tour is canceled due to severe weather, Kualoa will work with you to reschedule your tour. Refunds may be considered if no other accommodations can be made. A: Reservations are highly recommended. Each tour can accommodate up to 10 guests. We are happy to accept walk in guests, but only if there is space on a tour. During our busy season (May – Aug), tours are often sold out two to three weeks in advance. A: Yes. As with any outdoor activity, the Kualoa Zip Line Tour does involve some amount of risk. Our trained guides work hard to mitigate and manage those risks. Guests are required to read and sign a Participant Agreement to ensure everyone is aware of the risks involved. A: Closed-toed footwear with a closed heel or heel strap is required for all guests (sneakers, hiking boots, crocs, etc.) Clothing should be comfortable and allow room for movement. Jewelry and body piercings should be removed to avoid getting caught on safety equipment. A: FREE lockers available at the Zip Line Base Camp for wallets, keys, etc. There are two water stations on the tour so there is no need to bring extra water. 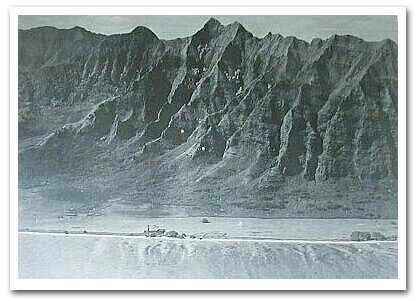 A: You can bring a camera with you, but Kualoa will not be responsible for any lost or damaged items (ex. dropped, rained on, etc.). There is a photo system in place that will take pictures of each guest while on the tour. Guests can purchase photos at the zip line base camp upon completion of their tour. All photos will be digital copies that are emailed to customers. Q: How Long will my Zip Tour Last? A: The total zip experience is approximately 3 hours. There will be around 45 minutes of drive time to and from the Zip Tour Base Camp. On the drive you will be able to see some of our many Movie Site locations. Our Zip Line Tour itself consists of 7 exciting tandem zip sections and 2 suspension bridges all connected with short uphill hikes and takes approximately 2 hours to complete. Q: When do I need to Arrive For my Tour? A: We ask that all guests check in at the Ticket Office at least a half an hour prior to the start of their tour. This will give time to read and sign the participant agreement, use the restroom, and gather at the Zip Line Shuttle Depot. Q: Are there Restroom Facilities? A: Restrooms are available at the main ranch, as well as at the Zip Line Tour Base Camp. There are no restroom facilities while out on the course. Q: What will I be Responsible to do on the zipline tour? 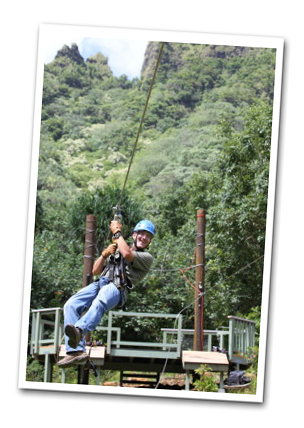 A: Three trained guides will accompany you throughout your Zip Line Tour. They will assist you by managing all of your safety equipment and running the state-of-the-art Automated Braking System for you. You will only be responsible for following safety instructions and enjoying the beautiful views. Q: I am Not Going to Zip, can I watch friends/family that are on the tour? A: Due to the remote location of the Zip Line Tour and limited space on the shuttle we will not be able to allow anyone who is not a Zip Guest to accompany the tour to the Zip Line Base Camp. Friends/Family that are not on the tour can enjoy one of our other tour options, or stay at the main ranch and tour our History Hall, Judd Theater, Petting Zoo, Aunty Pat’s Café, and Visitors Center retail gift shop.